“We see a desperate need for leaders who are founded on character, who have confidence, and who care about the islands,” he added. 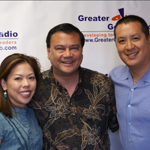 In this Greater Good Radio interview, Keli’i talks about Hawaii Youth For Christ and his pet project, the Center For Tomorrow’s Leaders, and how the latter is fast becoming a source of pride for many of Hawaii’s people. Listen now and find out more about Keli’i’s mission to uplift the community through the education and mentorship of tomorrow’s leaders. Keli’i Akina is president and C.E.O. of Youth for Christ Hawaii, the largest and longest running inter-denominational Christian youth ministry in the state of Hawaii. Keli’i oversees the four core organizations in YFC Hawaii, which are: (1) Campus Life – the largest extra-curricular club movement in local high schools; (2) Fellowship of Christian Athletes – a national brand outreach to athletes and coaches; (3) Center for Tomorrow’s Leaders – one of the premiere youth leadership development organizations in the country; and (4) YFC for Parents – a ministry which provides resources and conferences to equip parents to raise their teenagers. For nearly 27 years, Keli’i has served in nearly every capacity in Youth for Christ Hawaii and has represented the organization on a national level. Keli’i served as volunteer Chairman and C.E.O. of the Jesus Hawaii Project, an historic inter-denominational coalition of churches in Hawaii, for which he led a successful $1.7 million fund-raising effort immediately following the tragic events of September 11, 2001. Additionally, he directed the uniting of 191 churches in the work of the Jesus Hawaii Project, which mailed nearly a half million copies of the award winning Jesus Video to virtually every residential mailbox in the state. In 2002, Keli’i was appointed to the Pacific Century Fellows, a leading public and business leadership program in Hawaii, based upon the White House Fellows program. Keli’i preaches often in churches and at conferences locally and outside of Hawaii. He also does consultation and public speaking in the areas of leadership, motivation, and management, for which he draws upon his training as a Certified Human Behavior Consultant from the Leadership Institute of America and Certified Facilitator from the Chemical Awareness Training Institute. In 2003, Keli’i completed training with the Gallup Organization to become a StrengthsQuest Facilitator, enabling him to provide state of the art consultation in the area of helping leaders and organizations discover and develop their talents. In 1996, the Hawaii State Legislature’s House of Representatives passed a resolution recognizing Keli’i for “…unselfish commitment of leadership, involvement, and effort” in the cause of serving the community. Keli’i is currently on the faculty of Hawaii Pacific University as an adjunct professor of Humanities and Philosophy. He has also taught philosophy at the University of Hawaii at Manoa. Keli’i graduated from the Kamehameha Schools and holds degrees in the History and Literature of Religions and in Philosophy from Northwestern University and the University of Hawaii. He earned the Masters Degree in Comparative East-West Philosophy at the U.H. with the award of “distinction” for his thesis entitled: “Classical Confucianism as a Resource for a Chinese Approach to Human Rights in an East-West Context.” He is currently completing his Ph.D. in philosophy at the U.H. Recently, Keli’i has lectured on Confucianism and political issues at the East-West Center Fellows Educational Program and was a panelist in the 2003 Shunzo Sakamaki Extraordinary Lecture event sponsored by the U.H. Outreach College. Keli’i also recently lectured on “Asian Philosophy and Sustainable Economic Development in Asia” at the University of Hawaii School of Business Administration. Keli’i’s extra-curricular academic activities include sponsorship of forums and panels, including “The Great Debate: Does God Exist?” which drew 1,147 attendees to the U.H. Campus Center Ballroom. Keli’i and Patty live in Honolulu and have four children. Keli’i has served as an elder and Sunday School teacher at Leeward Community Church of the Christian and Missionary Alliance. He is also an active member and patron of the Honolulu Academy of Arts, The Contemporary Museum, and other cultural institutions. When visiting major cities, Keli’i loves to explore art and science museums, explore used book stores and take in concerts and plays.